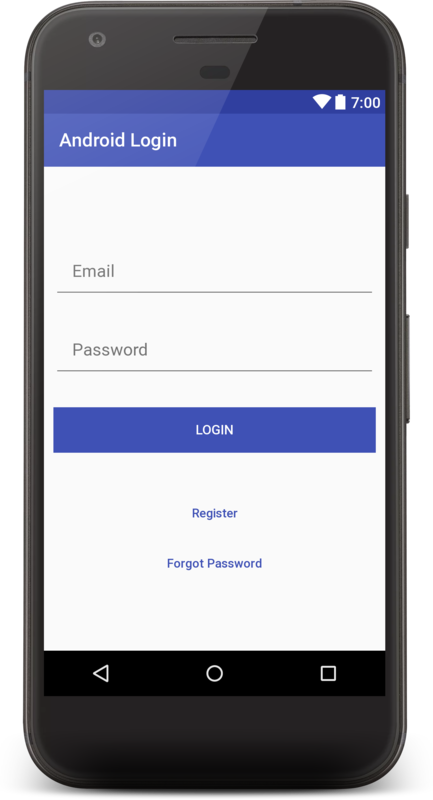 In this tutorials, you will learn how to develop a complete Android Login Registration System with PHP, MySQL, and SQLite Databases. *Login, Registration, Reset Password, Change Password. *PHP API to handle the JSON Login requests. *MySQL database to store the user data. *SQLite database to store Login data. In other words similar to the cookie in web browsers. Download & Install WAMP server from www.wampserver.com/en/. Once installed, launch the program from Start ⇒ All Programs ⇒ WampServer ⇒ StartWampServer. If you are on Mac, alternatively you can use MAMP for the same. You can test your server by opening the address http://localhost/ in your browser. Also, you can check phpmyadmin by opening http://localhost/phpmyadmin Following is a screencast of Downloading and Installing WAMP Server. Open phpmyadmin and execute below queries to create necessary database and table. Here we are creating only one table users to store users login information. Go to the location where wamp installed and open www folder. The default installation location of wamp would be C:/wamp. Below is the final PHP project structure we are going to create in this article. 1. Go into www folder and create a folder named android_login. This will be the root directory of our project. 2. Now inside android_login, create a PHP file named config.php and add below content. Now we have all the required classes ready. Let’s start creating the endpoint for user registration. This endpoint accepts name, email, and password as POST parameters and stores the user in MySQL database. In android_login root directory, create register.php with below code. Create a PHP file named reset-password.php with below code. Create a PHP file named verification.php with below code. 1. In Android Studio, create a new project from File ⇒ New Project and fill all the required details. more details go to Create New Android Project. 2. Open build.gradle and add volley library support under dependencies. 3. Under helper package, create a class named Functions.java and add below code. In this class we declare the login, registration, email verifies and reset password URLs. While testing you need to replace the IP address with your localhost PC IP. 4. Create a class named MyApplication.java. This class extends from Application which should be executed on app launch. In this class, we initiate all the volley core objects. * Created by Akshay Raj on 6/16/2016. 5. Under helper package, create a class named SessionManager.java and add below code. This class maintains session data across the app using the SharedPreferences. We store a boolean flag isLoggedIn in shared preferences to check the login status. 6. Under helper package, create a class named DatabaseHandler.java and paste the below code. This class takes care of storing the user data in SQLite database. Whenever we need to get the logged in user information, we fetch from SQLite instead of making a request to the server. * Created by Akshay Raj on 13-03-2016.
private static final String CREATE_LOGIN_TABLE = "CREATE TABLE " + TABLE_LOGIN + "("
7. Create an XML layout named reset_password.xml under res ⇒ layout. 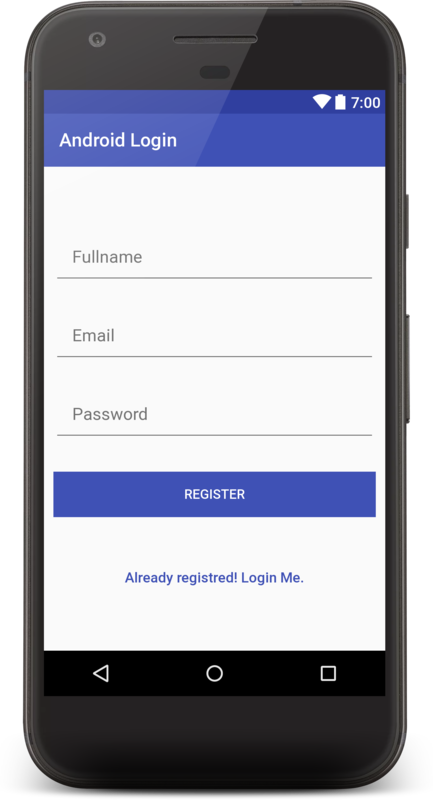 My previous article Android Login and Registration with PHP & MySQL gives you a good and simple overview of Login and Registration System. 8. Create an XML file named activity_login.xml under res ⇒ layout. 9. Create an activity class named LoginActivity.java. 10. Create an XML layout named activity_email_verify.xml under res ⇒ layout. 11. Create an activity class named EmailVerify.java db.addUser() – Will insert the user in SQLite database once he is successfully verified his Email. * Created by Akshay Raj on 06-02-2017. Until now we are done with login, registration and email verify screen. Now we’ll add the final screen to show the logged in user information. This information will be fetched from SQLite database once user is logged in. Here are two buttons for logout for destroy current session and change password for change old password. 12. Create an xml file named activity_home.xml under res ⇒ layout and add below code. 13. Open the HomeActivity.java and do below changes. Here we are just fetching the logged user information from SQLite and displaying it on the screen. 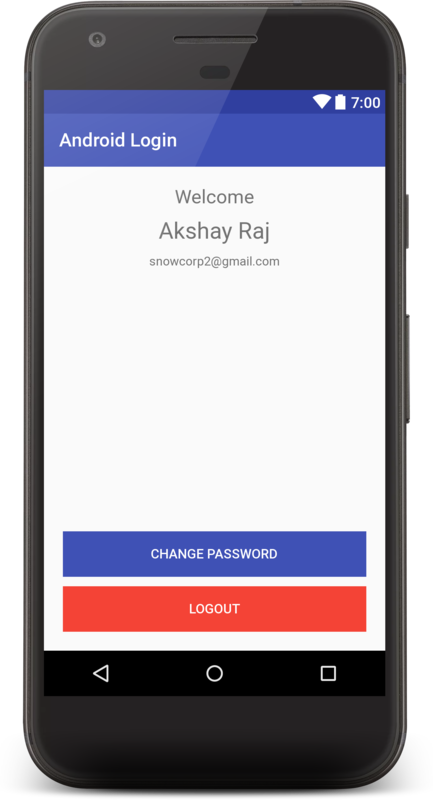 The logout button will logout the user by clearing the session and deleting the user from SQLite table and Change Password button for changing current password. Join our mailing list to download the complete source code. Everything works fine except that I never receive the verification code by email. Everything works fine except the verification code that I do not get on my email address. I am on an external server. did you use this on real server, not localhost? Actually, mail() function not working on localhost. I am on an external server and the mail goes well but never arrives. Should the support@androidlearning.in address be changed in the register.php or not? I need more information on “otp” and email verification. Could you please inform where or how can I find the above info? When you’ll register then you’ll receive an email with 6 digits number. 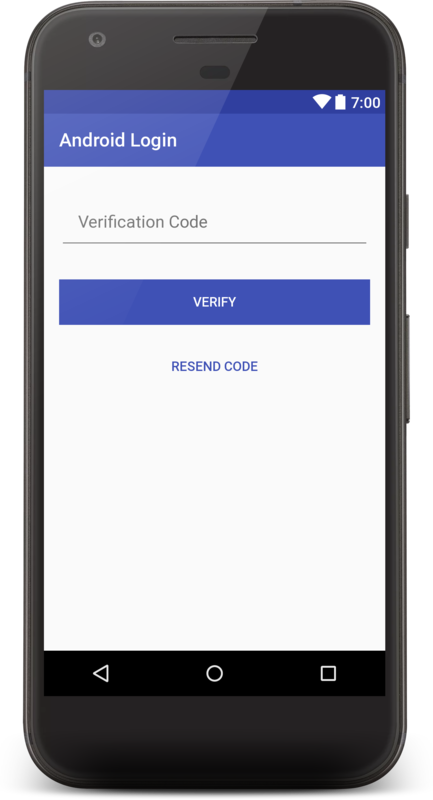 you need to provide this code to email verification activity to verify email. great login App, thank you. I have made a new project and added this files. app is closing without showing any matching errors in error log. hello, In forgot password, mail is sent but not received. Below is the error log. Please help. [Thu May 24 10:25:34.653603 2018] [mpm_winnt:notice] [pid 10060:tid 680] AH00364: Child: All worker threads have exited. [Thu May 24 10:25:34.702636 2018] [mpm_winnt:notice] [pid 8924:tid 760] AH00430: Parent: Child process 10060 exited successfully. [Thu May 24 10:25:40.564123 2018] [mpm_winnt:notice] [pid 6424:tid 656] AH00354: Child: Starting 150 worker threads. I am getting error at b.putstring(“email”,email) in login activity,and also in getString method. I have exactly the same problem to find the solution? Sir i have executed the app but when i goto register activity then it goes to login activity and when i try to login then app crashes and closed. There is no data in mysql database. Please help me sir. The first user is created perfectly, but when I try to register the second user it says “Database Error2. Please Try Again!”. I removed the first user from the mysql db and it again registered the 1st user and again an error on registering the 2nd user. I have nothing in my email when asking verify code, whats wrong? did you try with online server? can please give me an example of how to do that am using this for my final year project thank you. OK thanks very much let me try that ,i will get back to you if i run in any error.Is that ok?